A dazzling novel in the most untraditional fashion, this is the remarkable story of Henry DeTamble, a dashing, adventuresome librarian who travels involuntarily through time, and Clare Abshire, an artist whose life takes a natural sequential course. Henry and Clare's passionate love affair endures across a sea of time and captures the two lovers in an impossibly romantic trap, and it is Audrey Niffenegger's cinematic storytelling that makes the novel's unconventional chronology so vibrantly triumphant. An enchanting debut and a spellbinding tale of fate and belief in the bonds of love, The Time Traveler's Wife is destined to captivate readers for years to come. Several friends have been trying to get me to read The Time Traveler's Wife for awhile now, and for this reason or that, I kept putting it off. They kept telling me that in addition to it being a fantastic story, I'd love it as it takes place in Chicago and that I'd recognize so many of the places talked about in the story (and for those that don't know me that well, I have a love affair with the city of Chicago and will be moving there, someday!). Well, they were all right on all counts, and I'm just sorry that it took me so long to getting around to reading this wonderful book. 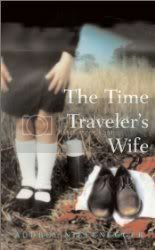 The Time Traveler's Wife is the story of Henry and Clare. Henry is a time traveler; he has a genetic disease that causes him, at random intervals, to fall out of his present and arrive in different locations and times, and never of his choice. Henry seems drawn to Clare continually during his time jumps, from the time that she is a child, continuing through until he meets her in his own present. This is one of the amazing aspects of the book to me, how Niffenegger was able to tell this story: Clare's story moves forward in a clear chronological pace, yet Henry falls in and out of her life at various ages, so that while one meeting with Clare will find Henry in his 40s, the next may find him in his 30s, and he must become continuously aware of his place with Clare, as what is happening in her present may still constitute his future or past self. Niffenegger tells their story honestly. It isn't always good between Henry and Clare, and we are carried along on the ups and downs of their relationship. It can be a roller coaster of a ride sometimes, but ultimately, isn't that what all relationships are about? The ups and downs, good times and bad? However, when the times are good, Niffenegger buoys us along with their happiness, and you just know it's going to be OK. I started out listening to an audiobook version of the story, but by the time that I was getting to the end, I couldn't wait until the drive into work the next day to continue the story so pulled out my copy of the book and found where I left off and continued reading. The ending, even though you have a vague foreshadowing of what's to come, is still amazingly powerful. Some parts of the book seemed a little too long for my liking: scenes where entire games of pool are described, for instance, seemed a little more detail than was completely necessary to keep the story moving. These handful of scenes aside, the book moves along at a comfortable speed. You might think that the jumping back and forth between times might be a little confusing, and it does seem daunting at first, but once you get into the groove of the story, everything moves along nicely and the time jumps aren't even noticeable. Another word on the audiobook production: it is narrated by William Hope and Laurel Lefkow and since the book is written from both Henry and Clare's points of view, this makes for a nice listening experience, as both characters literally have a voice of their own. When all is said and done, The Time Traveler's Wife is an amazing book and comes highly recommended. A reread from last year so I'm just going to post my review from before, but I found this at a used book store this weekend in Chicago (since I had checked the book out from the library before, I thought I'd like to have a copy of my own) and gave it a quick read on the train ride home. Ella Minnow Pea is a girl living happily on the fictional island of Nollop off the coast of South Carolina. Nollop was named after Nevin Nollop, author of the immortal pangram,* “The quick brown fox jumps over the lazy dog.” Now Ella finds herself acting to save her friends, family, and fellow citizens from the encroaching totalitarianism of the island’s Council, which has banned the use of certain letters of the alphabet as they fall from a memorial statue of Nevin Nollop. As the letters progressively drop from the statue they also disappear from the novel. The result is both a hilarious and moving story of one girl’s fight for freedom of expression, as well as a linguistic tour de force sure to delight word lovers everywhere. This was just a plain fun little book to read! What would happen if the use of certain letters of the alphabet was systematically forbidden? What would you do? Ella Minnow Pea lives on the fictional island of Nollop, an independent country off the coast of South Carolina. Nollop is so named after Nevin Nollop, creator of the pangram "The quick brown fox jumps over the lazy dog." When a letter falls from the monument to Nollop, the ruling council determines that this is Nollopian divine intervention and that the fallen letter must be stricken from use, both verbally and literally. As more and more letters fall, all Nollopians must learn to cope with the increasingly difficult task of making sure that they neither speak nor write words that include these letters. The book is told through correspondence between the people who live on Nollop, and Mark Dunn is genuinely quite clever in how he presents these letters as the Nollopians lose the rights to use one letter after another. I can honestly say that I had a fun time with trying to work out not only the new ways that the Nollopians found to speak, but also the solution to their problem. This wasn't a particularly challenging book to read, but it was a lot of fun and well worth the time. Give it a read sometime if you're looking for something amusing, clever and completely escapist. OK, I'm going to come clean. I didn't like A Light in the Attic. At all. Is everyone over their collective gasp of disbelief? Good. Let me explain. I don't think I remember ever reading Shel Silverstein as a kid. I mean, I must have, right? Every kid has. But beyond The Giving Tree, I have absolutely no recollection of ever having picked up another book by Silverstein. My sister, on the other hand, loved him as a kid. Somehow, I just skipped over that bit of growing up, I guess. My sister loved him as a kid, and still loves him today as an adult. In fact, she has all of her copies of his books from when she was a kid. 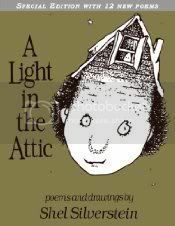 So, when I heard they were coming out with this anniversary edition of A Light in the Attic that included several new poems, my first thought was that I needed to get a copy for her for her birthday, and it was being released close to that date. My second thought was that I should also buy a copy for myself. I felt I should have a copy in my library, since everyone just goes on and on about him. For future reference, I'm going to simply read what my sister has, that way I won't feel like I wasted my money. Now, don't get me wrong. I own The Giving Tree and love it. I reread it periodically. It's a great little book. I cannot say the same of A Light in the Attic. I know the poems are geared towards kids, and that they are to be taken completely tongue in cheek, but that still hasn't stopped me from wishing I hadn't bought the book. I was actually shocked by the poems that dealt with kids dying (not that I'm so easily shocked by anything, really, but it really did come as a surprise to me) and thought some of them completely distasteful. Of course, to a kid, that sort of thing can be hysterical. I thought the illustrations were amusing, but not much more than that. So, I think I missed my formative, Shel Silverstein-liking years. I guess to the right kid, these are great, but for my 34-year-old self who has never read them before and hadn't appreciated them as a kid... well, I won't be picking up another sampling any time soon. 71. X-Men: Blinded by the Light by Mike Carey, et al. Author(s): Mike Carey, et al. Rogue is still recovering from the events of Supernovas and then X-Men are barely getting an opportunity to relax as they are being hunted, but to what reason? A basic filler storyline going from Supernovas to Messiah CompleX. 68. X-Men: Supernovas by Mike Carey, et al. Authors: Mike Carey, et al. Supernovas brought about some significant changes for the X-Men team that Rogue leads. Cyclops basically gives her full reign to choose a team as she sees fit, and while in the end the team isn't exactly to his liking, she reminds him that he let her choose her own team, and they leave it at that. The volume is broken into three distinct story arcs, the first dealing with The Children of the Vault, a group of humans that were housed in a time accelerating field, so that in the some-odd years that they were housed in the ship where the machine was located, something like 6,000 years have passed, so they can almost be viewed as a separate species now. 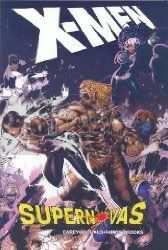 They want to keep their existence a secret for the time being, but Sabretooth has discovered them, so they go in pursuit of him, and he eventually turns to the X-Men for help and asylum. The Children of the Vault attack SHIELD and capture Northstar (who SHIELD is trying to rehabilitate) and Aurora, to aid them in attacking the X-Men. The story becomes a little convoluted (a little, some ask?) 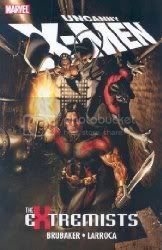 but ends with The Children of the Vault defeated and the X-Men commandeering their flying barge, the Conquistador. The final story arc deals with Rogue and her team going after the members of the hospital responsible for dissecting mutants and trying to gene-splice their powers onto regular humans, the ultimate goal of which is to create a "super" human out of Pandemic, a former colleague of Professor X, who sees Rogue and her ability to borrow the powers of people she touches as the next step in his evolution, even though he is human. Lots happens here, but the base result is, Pandemic is defeated (by absorbing Sabretooth's powers, including his healing factor) and Rogue is infected with Strain 88, which causes her powers to fluctuate way out of control, to the point that she will instantly kill anyone who touches her, absorbing all their powers and memories. Meanwhile, Providence is attacked by the Hecatomb, a weapon created by the Shi'Ar to defeat the mummudrai (telepathic parasites). A mummudrai makes its way to Earth, and eventually attaches itself to Cable, in an effort to defeat the Hecatomb, but in the end it is Rogue who saves the day, absorbing all 8 billion minds that compose the Hecatomb and making it vulnerable to an attack from the X-Men. And now Rogue is crazy. So much happens in this volume, and it does seem to jump around quite a bit, but it is refreshing to see some stories that revolve around some of the more sidelined X-Characters instead of the old standbys. 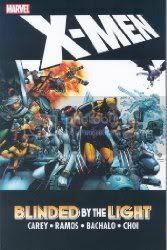 Cyclops, Beast, Wolverine, Emma Frost and such do make an appearance in this volume, but they are as peripheral characters, with most of the action revolving around Rogue's team. Mike Carey keeps the pace non-stop through the volume, almost hectically, leaving the read thrown from one even to the next. It does make the story just fly by, but so much is happening, and again, so many characters are thrown into the mix, that the story almost becomes distracting despite itself. Dickens' perennial Christmas classic about Ebenezer Scrooge and his visits from the ghost of his former partner, Jacob Marley and the Ghosts of Christmas Past, Christmas Present, and Christmas Yet to Come and the Christmas lessons Scrooge learns from them. I try to read this every year around the holidays, and it never seems to get old. There's really not much else to be said about the story that hasn't already been said before, so I'll just leave it at that. One thing that I would like to talk about, however, is the new Disney animated feature film version of A Christmas Carol. As I said previously, I'm very close to this story as I read it every year around the holidays so Disney and Robert Zemeckis had to do a fairly bang up job on the film to impress me, and I have to admit that on almost all accounts, they did. They took very few liberties with the story, sticking very close to the source material for much of the dialogue, and what was added did seem to be necessary. The slightly over-the-top chase sequence with the Ghost of Christmas Yet to Come was just that, over-the-top, but I understand the necessity to put something like that into the film. The Ghost of Christmas Yet to Come sequence is a little on the long side, dark and moody and I can understand why they were trying to lighten the mood for the kids in the audience, but really, it didn't feel like it was a part of the story to me. The animation is breathtaking, being rendered in complete motion capture 3D CGI. The sweeping, aerial shots of 1840s London were something to behold and the characters themselves were quite believable. Overall, coming from someone who has a great attachment to the book, I can happily say that I was pleasantly pleased with the outcome of the movie. 67. 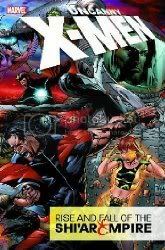 Uncanny X-Men: Rise and Fall of the Shi'Ar Empire by Ed Brubaker, et al. Authors: Ed Brubaker, et al. I've been a little behind on one of my guilty pleasures over the last couple of years, and that's my X-Men comics. I've been reading this series since 1986, and my interest has waxed and waned over the years, but I always inevitably come back to reading the series. I can tell how my reading preferences have changed recently, however, as reading the series in its monthly installment form has not been able to hold my interest at all, so I've instead been picking up the collected story arcs in trade paperback form. Not only is it cheaper in the long run (especially ordering them through Amazon), but it takes up much less space and is easier to organize the volumes on my book shelf. There is so much back story with the series running for over 40 years now that it's hard to just pick up the series with any issue these days, as well as the fact that most story arcs are written into a 5-6 issue format, knowing that these will be published into a trade paperback form. I can't imagine anyone new trying to figure out what's going on with the characters these days. I've been reading for quite some time now, and I always find myself at a loss when I've taken a break. My other problem is that I have a tendency to jump around quite a bit when I'm reading some of the older but more recent trade paperbacks, so I get a little confused as to the series of events and what happens when. Rise and Fall of the Shi'ar Empire was one of the bigger events, spanning the course of a year, which in terms of story arc length, I think is rather involved. The story basically picks right up where Deadly Genesis left off, with Vulcan escaping Earth and going on a rampage through the Shi'Ar Empire, in search of the man that he holds responsible for all the wrongs in his life, the Emperor D'Ken. What Vulcan doesn't know is that D'Ken has long since been dethroned and is currently in a catatonic state. Feeling himself responsible for Vulcan's fate, Professor X forms a team of X-Men to go into space to try and capture Vulcan and bring him back to sanity. There was so much that went on in this issue, it would be tough to get it all into a reasonable blurb, so I'll stop there. Basically, the issue ends with Lilandra deposed, Vulcan crowning himself emperor and half of the X-Men team that went into space is stranded there with the Starjammers, and they decide to stay to try to overthrow Vulcan and reinstate Lilandra as empress. And if none of that makes sense to you, you probably aren't alone. Like I said, so much back story makes it almost impossible to follow the story sometimes! There was a lot to cram into this storyline, and I think Ed Brubaker did an admirable job, but there were some instances where the story jumped around a little too much, making it hard to follow sometimes. Couple that with the shear number of characters that they tried to add into the mix, and what you end up with is a sometimes overly complex story. The art is good, alternating between Billy Tan and Clayton Henry, but their styles are so disparate, that reading the volume as a whole as opposed to the monthly issues, the differences become immediate. Billy Tan's artwork is so hyper-detailed in some instances that it's hard to follow what exactly is happening in some panels. Overall, however, artistically speaking the volume works well. 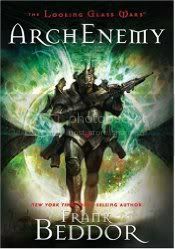 The final chapter in Frank Beddor's The Looking Glass Wars, ArchEnemy really is a satisfying ending to the series. He ties up all the plot lines nicely and doesn't leave too many unanswered questions that may lead to more in the series, even though I wouldn't mind seeing more from Beddor and his take on the Wonderland characters. King Arch makes his move to take over Wonderland using the best weapon he can come up with, the destruction of imagination as a whole. However, both Alyss and Redd may think differently about his plans. They form a tenuous partnership to help each other overthrow Arch, even though they both understand that either may betray the other when they find the right opportunity. And what role do the caterpillars play in all of this? Whose side are they on after all; their own, or do they actually have the best interest of the Heart Crystal in mind? I can honestly say that I don't think that Beddor could have done a better job tying up his plot threads, while adding enough new layers to the story to keep this book interesting in it's own right as well as an ending to his story. If Beddor doesn't continue on with his Wonderland characters, I'd like to see what he can come up with next. The second installment of The Looking Glass Wars, Seeing Redd opens a mear three months after Alyss Heart reclaimed her throne from her mad Aunt Redd, who along with The Cat flung themselves into the Heart Crystal instead of suffering the humiliation of loosing to her neice. But since the Heart Crystal is the spark of Imagination of the universe, Redd and The Cat find their way back to Earth through rather different means than the usual manner for Wonderlanders, the Pool of Tears. Finding herself on Earth, Redd discovers a number of Wonderlanders who have taken refuge there, and decides to build her army on Earth, hidden from Alyss, and plans her revenge. Meanwhile back in Wonderland, King Arch, the monarch of Boarderland, is planning his own assault on Wondertropolis, using any means of subterfuge that he finds useful at the moment. 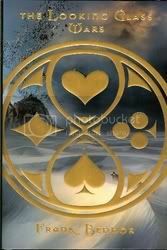 Eventually, Redd makes her way back to Wonderland, and finding that she and Arch have similar goals, strike up a precarious alliance. However, Arch has plans of his own that even Redd doesn't know of, in the form of his new weapon WILMA. Beddor continues to keep the pace fast and exciting in Seeing Redd, just like he did in The Looking Glass Wars. While we've left the similarities of Alice's Adventures in Wonderland and Through the Looking Glass behind in the last book, he continues to grow his cast of characters carefully, and each new character is just as imaginative as the last. I continue to be thrilled with this series. It's a fresh take on the Alice mythos and I'll be sad to see the series come to a close with the final volume, ArchEnemy. 75 is the new 100! Who am I kidding? There is NO WAY that I am going to even come close to reaching a 100 book goal this year, so I'm scaling it back to 75. Yes, it's cheating to decide to change my goal this late in the year, but it's my challenge and blog, so I can change it if I want to. So, there! I will, however, be trying for 100 again next year. I have a plan! Of course, I had a plan this year, and that flew right out the window by March, but I think I have a more achievable plan for next year, but more on that later. And is there no one out there who is willing to help me with my Baker's Dozen Challenge for next year? 69. Uncanny X-Men: The Extremists by Ed Brubaker, et al. Basically just a filler story that led from one big event (Rise & Fall of the Shi'Ar Empire) to the next (Messiah Complex), The Extremists finds the team that made it back to Earth back in the Morlock tunnels after discovering Caliban wandering the school grounds, after he had been attacked by Masque. It turns out, in a plot point very similar to the Destiny Diaries, that there was a Morlock named Qwerty who was able to see the future, and not just any future, but every future that could be. These visions eventually drove her crazy, but the Morlocks put her predictions down in a book, and after the events of M Day, they began to reallly pay attention to her predictions. Eventually, the Morlocks split into two factions, the ones that would just let Qwerty's predictions come to pass, and the ones that would make sure that the predictions would come to pass. This second group is led by Masque, who has taken it upon himself to lead in the great change that Qwerty predicted for all mutants in her book. Really, I didn't find the story all that compelling. Qwerty's book sounded too similar to the Destiny Diaries (which end up playing a part in the concurrently running X-Men: Blinded by the Light) and the whole thing read way too much like a forced filler for me, instead of a necessary bridge from one story to the other. I don't feel that there was anything that really moved the story along, except for the last page and the possibility that Magneto had not lost his powers. Not a bad story arc, but by far not the best. Thought you knew the story of Alice's Adventures in Wonderland? Well, think again, because that story was wrong. The Looking Glass Wars is the first installment of Frank Beddor's clever retelling of Alice's Adventures in Wonderland and Through the Looking Glass. Here we meet Alyss Heart, heir to the throne of Wonderland, where all imagination in the universe is born from. 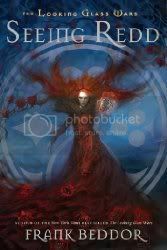 On her seventh birthday, her deranged aunt, Redd Heart, storms Heart Palace, killing Alyss' father and mother, taking control of the kingdom that she feels is rightfully hers. Alyss' mother, Queen Genevieve, sends Alyss away with Hatter Madigan to the Pool of Tears, through which they escape to Earth, but are separated. Meanwhile, General Doppelganger and what few survivors that still back Alyss and White Imagination, begin their counterattacks against Redd and her forces of Black Imagination. Thinking Alyss dead, they called themselves Allyssians in tribute and for 13 years try to overthrow Redd. During this time, Alyss is marooned on Earth, not knowing how to return to Wonderland and slowly loosing her powers of Imagination, where she is eventually adopted by the Lidells, and eventually she meets Charles Dodgson, who she feels will believe her tale when all others haven't. When he produces the book, Alice's Adventures Underground to her, she then realizes that he was her last hope, and begins to acclimate herself to life forever on Earth. Hatter Madigan eventually discovers here whereabouts and the two return to Wonderland, just in time to help reinvigorate the rebels and their fight against Redd. The story is incredibly clever, and you will recognize all the characters from Lewis Carroll's stories here, but completely re-imagined. I love how Beddor takes Carroll's stories and completely reworks them into this civil war between the forces of White Imagination and Black Imagination in the first part of the book, then uses Alyss telling Charles Dodgson the story and his reworking this story into Alice's Adventures in Wonderland, and then Beddor taking the story even farther from there with Alyss' return to Wonderland and the eventual battle between her and Redd. It's a fast-paced story that moves right along almost immediately in the book and doesn't really let up throughout. Die hard Alice fans may or may not like the changes to the story, but as a huge fan of Carroll's original stories, I can honestly say that I loved these reworkings! The first installment in J.K. Rowling's smash hit Harry Potter series, Harry Potter and the Sorcerer's Stone introduces us to all the key players and locales that will take part in the series: we meet Harry Potter himself, the boy who lived; Harry's remaining living family, the Dursleys (the worse king of Muggles); Hagrid, Keeper of Keys at Hogwarts; all the other instructors and staff of Hogwarts School of Witchcraft and Wizardry, including Albus Dumbledore, Headmaster of Hogwarts; Harry's best friends, Ron and Hermione; Malfoy, Harry's immediate enemy at Hogwarts; even Voldemort, Harry's archenemy, the dark wizard who tried to kill Harry when Harry was an infant and failed. I could go on about the story and what happens, but I'm sure that most everybody already has an idea of what goes on in the story, either from having read the book or seen the movie. If the only experience that you have with Harry Potter and the Sorcerer's Stone is from the movie, do yourself and favor and read the book; while the movie is fun and gives you all the basic story, it does leave out some key points and some of the funnier moments from the book. This will be a theme that plays out in all of the movies, and it gets worse as the books become more and more involved. Having the read the book several times already before, and having finished the series now, I can see the inconsistencies in Rowling's storytelling and structure, but at the same time, knowing what's coming, it's interesting to see where she had been dropping clues to the rest of the story from the very beginning. I also like seeing how she progresses as a writer throughout the series, cleaning up her writing style as the books go on. Also, again still going on the knowledge of what's to come, I had forgotten how refreshing and lighthearted these earlier books are, before the story starts to take on its more darker tones. Don't get me wrong, I enjoy the series as a whole, and may even enjoy the later books more than the earlier volumes, but that doesn't change the fact that this was still just a plain fun book. 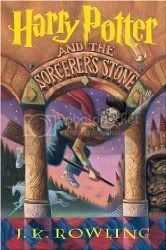 On a side note, I listened to the audiobook version of Harry Potter and the Sorcerer's Stone this time around, as I have never listened to any of the books, and I have to say that I really enjoyed Jim Dale's take on the characters and his telling of the story. It took me awhile to get used to his version of the voices (I'll be honest, I kept waiting to hear the voices more like they were in the movies, but the only one that seemed to match was Hagrid), but once I got into the story and his version of everything, I found it easier and easier to enjoy the audiobook. If you haven't had the pleasure of listening to the audiobook versions of the Harry Potter books before, take a couple of hours and give them a listen. It's worth it. Baker's Dozen Challenge - Help me out! OK, I know this may sound weird, but I had noticed earlier this year the number of books that I owned that had the number 13 somehow worked into the title, so I thought maybe it'd be fun to try a Baker's Dozen Challenge for next year; 13 books in the year with the number 13 somehow in the title. However, I'm having trouble coming up with thirteen books with 13 in the title, so I'm hoping that maybe I can get some help from every body on this one. So, put your thinking caps on and help me come up with three more books! I think the third book in the 13th Reality series comes out next year, so really, that puts me down to just needing two. I know that there are a couple more out there that are parts of series, but I don't want to have to read an entire series to get to the proper book, and I know there are a couple more YA books out there that I haven't put on the list but my list is rather YA heavy already, so I was hoping that there may be something that I'm missing that isn't YA (not that there is anything wrong with YA, but like I said, my list is already a little heavy on the YA side). OK, so the third book in James Dashner's The 13th Reality series is coming out next year, so I'm just down to 1 or 2 more books (if I can't find 2 more, The Twelve and the Genii will just have to do! ), so help a guy out here! Any suggestions? At all? I've got a full list for next year (Thanks, beserene!) with only one book in a series that I'll need to read a previous volume to get me up to speed. I'm excited about it, I think it should be a fun challenge! The Looking Glass Wars in one day - can he do it? So, I'm going to see if I can read all three books in Frank Beddor's The Looking Glass Wars series today. I have nothing planned to do today, so I thought I'd give it a try. I'll post my progress in the comments as I go along. Good morning, fellow Salon Members! I hope everyone had a safe and happy Halloween! It was a quiet night in with friends for me last night, watching The Nightmare Before Christmas and handing out candy to the trick-or-treaters. Of course, this morning I've been completely confused on what time it is (we had our autumn time change last night here in the U.S.) as some of my clocks changed time automatically and some didn't, so while I've run around the house picking up the detritus from Halloween last night (candy wrappers and whatnot), I've also been making sure all my clocks now match my cell phone. Silly time change. Luckily, in addition to simply sitting down and actually reading something, I can say that I had a really top-notch selection of books that I read this month. Everything was really good! I just hope that I can finish out the year with books as good as these are. I am still working on Joe Hill's collection of short stories, 20th Century Ghosts, and while I could have probably finished that by now, I have been so impressed with the quality of these stories, I have been taking my time and savoring them. Like I said in my previous Sunday Salon about these stories, they have real heart and soul, so I've been taking my time with them, delaying the inevitable conclusion of the book. Starting this week, I'm going to be house-sitting for my mother while she is in Florida visiting family, and this is always a good reading time for me, so I've been deciding on what I'm going to take with me. I inevitably take more than I read whenever I go to stay, but at least I know that I have a good selection of books to get me through the two weeks. Today is one of my best friend's birthdays, so we are going off to go book shopping; what a great way to spend a birthday, right? One of our local independent bookstores, Nicola's Books, sends out an email around your birthday each year with a coupon for a free book, so we're going to take advantage of that, and maybe see what other stores we can stop at on the way over there. I'm going to try to squeeze in one more Joe Hill story by the end of the day, and then I don't really know what I want to move on to. I've got a couple of advanced reader copies, but they aren't on the street until sometime in January, so I may wait on those awhile yet. Maybe something light and fluffy today. Or maybe I'll find something at the bookstore that will be perfect!